Eight Rohingyas belonging to two families, including two women and four children, were apprehended on Wednesday at Khayerpur, 12 km north of Agartala. They shall be produced before a court today. According to the report they were on their way to Agartala boarded on an inter-state bus but they landed at Khayerpur mistakenly and were spotted there in a shed. Police were informed about them who, thereafter, took them to the police station. 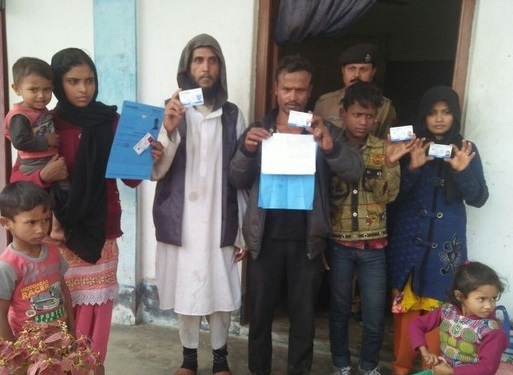 Apprehended Rohingyas showing their refugee cards. During interrogation they disclosed that they had sneaked into India from Bangladesh and via West Bengal had gone to Jammu and Kashmir few years back. However, now they came to Tripura in search of job.